Have you finally decided it is time to purge your home of junk? It is amazing how items add up over the course of time. It is common for you to replace furniture, electronics, toys, clothes, exercise equipment, and other things a little at a time. Most people place the old stuff in storage. We also remove construction debris, yard waste, and moving boxes. If you are ready to get rid all of that excess stuff Junk Drs is here to help. We provide full-service junk removal Raleigh for homes and business in Raleigh and the surrounding areas. We can normally get rid of 10 years or more of stuff in the matter of an hour or two. Do you need Raleigh Business Junk Removal Services? 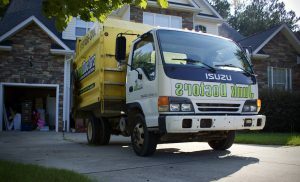 Anytime you pick a Raleigh junk removal company, you’re selecting more than a trash pickup. Removing junk is all about reputation and quality. Junk Doctors knows the key to any local business’s survival is to maintain a great reputation. We have instilled an obsession over reputation into the culture of our company. It is our goal to strengthen our reputation every time we come in contact with a customer, starting at the initial booking and continuing through the follow-up call you will receive after your job. Getting rid of those junkies is normally something that most people could do themselves. However, who wants to take up a huge chunk of their weekend, risk damaging their property, or possibly injure themselves when there is an easier option? Junk Doctors provides two strong, trained, and professional team members to go all throughout your home to remove your rubbish. The team is equipped with the tools to do the job right. The end result is your junk is cleaned out in a fraction of the time that you could do it yourself and you haven’t even broken a sweat! How Does the Junk Removal Raleigh Process Work? We’re proud to supply the rubbish removal procedure that is simplest within the industry. You’ll be able to guesstimate your cost/load size on our Triangle Junk Cleanout and Removal Pricing page. You can then schedule online or give us a call. We will need some basic information to get a two-hour arrival window scheduled for you. Once we arrive our team will ask you to show them everything you have that is being removed. We will provide you with a firm price. If you give us the go-ahead to proceed we will then load your junk. At the conclusion of the job, you can settle up by cash, credit card, or check. We will then take your stuff off to be recycled, donated, or disposed of. What Sort of Junk Can I Dispose of? There are some items that we are not allowed to transport due to local regulations. Those items that we cannot take are considered to be hazardous waste. Common items are paint, motor oil antifreeze, gasoline, etc. Wake County has set up two Household Hazardous Waste facilities that Raleigh residents can take their hazardous material too. The first one is at the South Wake Landfill which is located at 6130 Old Smithfield Rd. in Apex. The other facility is the North Wake Landfill at 9037 Deponie Drive in Raleigh. Which is better? a Dumpster Rental or Junk Cleanout/Removal? If you are looking to do a one time purge of general household junk, electronics, exercise equipment, moving boxes, etc. then junk removal is normally the way to go. Since it is full service the process is much quicker. You don’t have to schedule a time for the dumpster to be dropped off and picked back up. With junk cleanout/removal everything happens all at once. All labor is also included with a junk hauling service compared to with a dumpster rental service. Another advantage is the fact that Junk Drs is sorting through your items so we can donate and recycle as much as possible. The dumpster rental companies in the Raleigh area do not offer that service. Dumpsters cannot accept electronics and nothing is donated. Anything that goes in a dumpster is going to either a landfill or a transfer station. Dumpster rental is a good option for a home renovation that will take several weeks. A dumpster can be dropped off and you can fill it as you go. When it is full you would simply call the company to come pick up the dumpster. That is normally when a dumpster rental is a good option. Junk Doctors does Junk Removal Raleigh construction debris as well. If you do not have space to put a dumpster you can pile the stuff in the backyard. Junk Doctors can go into your backyard, bring the items to the front, and remove them for you. One circumstance that is always difficult to deal with for many reasons is when you lose a loved one. Junk Removal Raleigh does four or five estate clean outs every month. Cleaning out an estate is normally a very overwhelming job not only for the work involved but the emotions that are experienced as well. The estate needs to be sorted through so you can find items that you would like to auction, confidential items that need to be shredded, and other items that you would like to keep for sentimental reasons. Junk Drs is able to assist you with all of this. When you hire us for an estate clean out we can assist you with sorting through your items and then remove items you would like to get rid of. This is priced with a combination of our general labor rates as well as our junk removal Raleigh rates. Call for details on how to price these jobs. Sometimes when cleaning out an estate in order to save money, or give you have extra time it might make sense to go with a dumpster. A dumpster will allow you the time to sort through everything without having to pay an hourly rate for our team members. However, it makes the task that much more difficult with you having to do all the labor yourself. 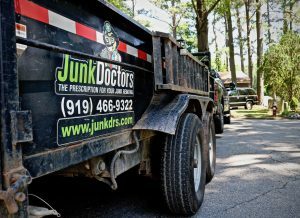 Junk Doctors tries hard to recycle and donate as much of the stuff from your junk removal Raleigh project as possible. Any larger items such as couches, dressers, beds, etc. can be easily spotted by our guys for donation. If they are in good enough shape to be donated we will take them to a donation center on your behalf. If you have any items that are smaller you would like donated you would need to have them boxed before we arrive and labeled “donation”. Call Junk Doctors for your junk removal Raleigh project today at 919-466-9322. We recently used Junk Doctors to remove some unwanted items during a move. It was a hassle free great experience from start to finish. Appointment was easy to schedule and once they arrived, they worked very quick and clean up when they are done. Reasonable price as well. I would highly recommend their service if you are in need of junk removal! Awesome service! Super nice, prompt, priced well and great customer service. Will definitely use them again. Love this company! They are friendly and prompt. Removal of my old refrigerator was easy and affordable thanks to them. I used the Junk Doctors to empty a storage building and clean out all kinds of trash behind it. They came on time and were professional and efficient. I couldn't have asked for more polite and pleasant service. I whole heartedly recommend them! The arrived when they said they would. Very professional and saved me a lot of hassle. Good job guys.